At least once a year, when it's cold and blustery, I find myself craving this dish, which I was introduced to as an exchange student in the French Alps. My host mother was an amazing cook, and I have very fond memories of the time I spent living there, so this dish makes me feel all cosy and nostalgic. My lovely boyfriend Patrick recently lived in France; plus we both pride ourselves on our cooking efforts, so I decided it was time to share this beautiful dish with him, and as is often the way my sis & bro-in-lo. As the translation suggests, this dish is basically sauerkraut with sausages - pork pork pork, potatoes, cabbage - but the fun is in the trip to the local butcher shop and the astonishment this dish will cause. I was unable to fit both halves of the pork shoulder and the hock in the pan, so all up I imagine it was roughly 2 kilos in the end. I had 3 cans of sauerkraut, which made between 1 to 1.5 kg and as soon as I decided it was on, I rinsed and then soaked the sauerkraut in cold water, for the time it took to go to the butcher and grocer nearby. I then put my large casserole on the stove with the hock, shoulder and generously diced (1" oblongs) bacon covered in water, to bring to the boil. In the meantime I peeled and halved or quartered the potatoes and finely sliced the onion. I usually omit the carrot, I find the sweetness takes away from the dish, and today was no exception (and anyway I had run out of real estate in the pan!). Once the meats were at a boil, I took them off the heat; then rearranged, in layers: the bacon; drained (and hand pressed & untangled) sauerkraut & onion; then the pork shoulder, ham hock & spiced sausage; more sauerkraut; clove, thyme, parsley, salt, pepper, pepper, pepper and juniper berries. Then some dry apple cider instead of wine and water to cover. There is then time to clean up the kitchen hurricane as you bring to the boil then simmer everything for just over an hour. Then it's time to remove the meat "garnish" (the French to English translation in this book is very confusing at times). I placed the hock and shoulder into an ovenproof bowl with a lid in the oven just under 100°c to keep warm, with a ladle-full of the soupy pan juices. Then back to the sauerkraut on the stove, add the potatoes and push them in until they are submerged in the soupy-juice and covered with a warm doona of sauerkraut. Boil/simmer for about half an hour. I say "boil/simmer" because in my current house the gas is either "on very flamey" or "low flame but precariously likely to suddenly go out and continue to fill the room with unburnt gas". Plus as long as you pop by every now and then, it should be fine. Some extra heat or time is not necessarily a bad thing here as the flavour just gets better and better. You can top up with water at any time to counteract the boiling. After that, put in the pork sausages (or if you follow the recipe use frankfurters - they didn't have any that I liked the look of at the butcher by mid afternoon) and push them under the surface gently. Then plonk the rest of the meats in or on; heat for 20 minutes, then you're ready to serve (or just pop the lid on on low heat or in the sub-100 oven until all your guests are in the door, salutations and settings are done. Get ready for a feast, food coma and family fun times! It's totally worth the effort - well, at least once a year! I split the larger ingredients to make for safer serving and then once we'd all had a go, I popped everything back in the pan together. This amount was good for all four of us to have a decent serve, and seconds, or was that thirds, plus three generous leftover serves that I savoured over the week to follow. Rye or sour dough bread to sop up all the delicious soup-juice is highly recommended! 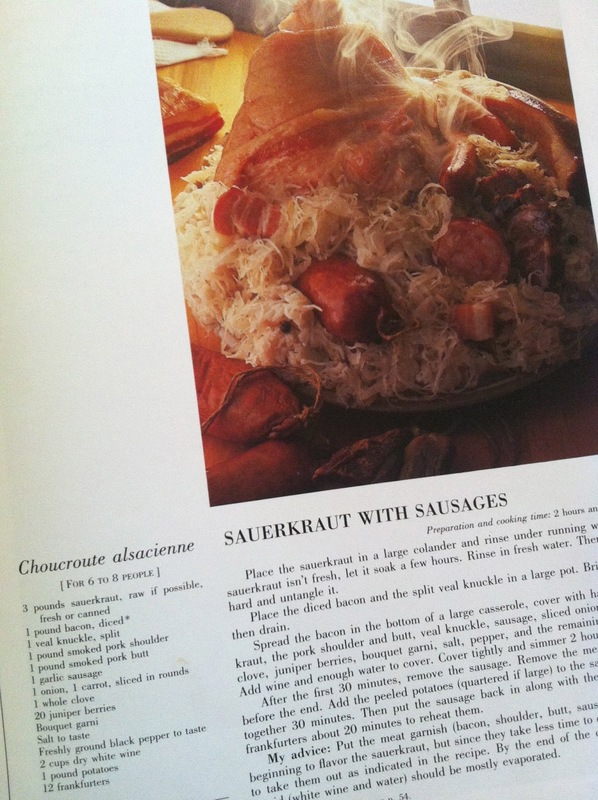 I favour apple cider with this dish, but as we all proved that night, choucroute goes well with beer, white wine and red wine to suit all drinking tastes! Definitely aiming to make this pork extravaganza before winter is over! That gives me... one week? Ah, I'd better get hock hunting!! Looks amazing Dea. I'm already imagining my husband in a happy little meat coma! Aww, lucky husband! It is very coma inducing! Such a good family fun dinner dish!